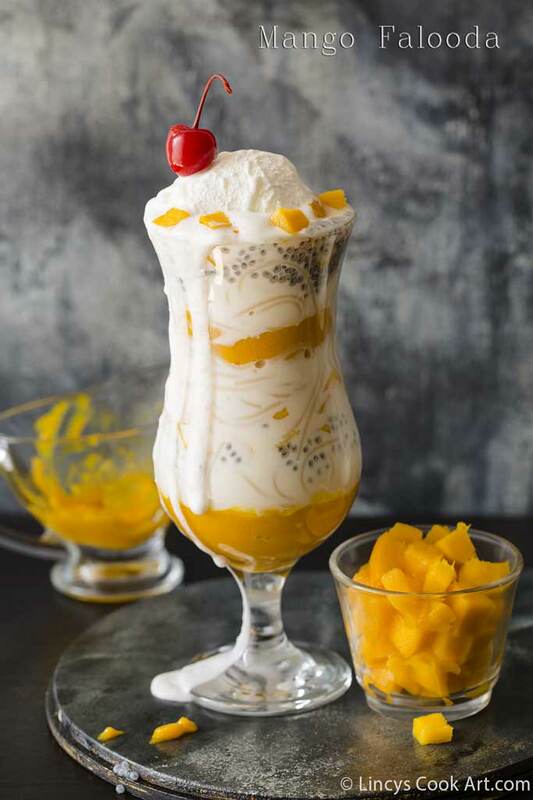 Mango Falooda is a tasty summer beverage prepared with mango puree, milk and with some vermicelli topped with ice cream. Perfectly suits this mango season and also for the hot summer. 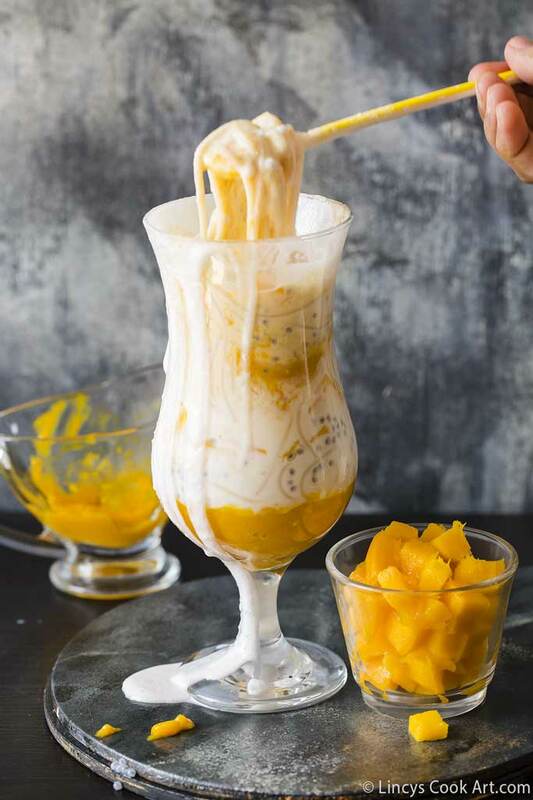 Quick to prepare rich mango drink in a jiffy!It acts as a thirst quencher as well as fills the stomach. 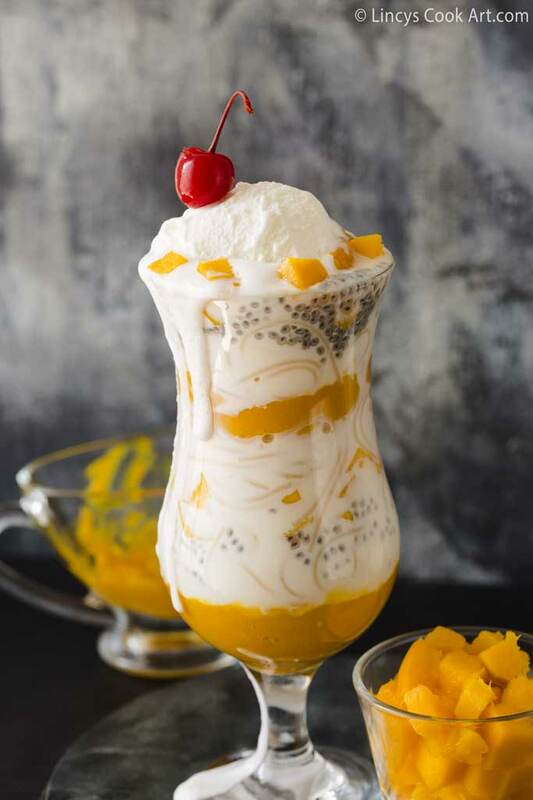 Once you prepare the ingredients in huge quantity you can prepare the Falooda drink in various flavours like Strawberry, Rose, Pistachio..etc or flavour or fruit of your choice. Check my other easy to prepare Summer Cool Drink Recipes too. Boil the milk with sugar and reduce the flame and allow to reduce for 10 minutes once it boils.Transfer the milk into a glass and allow to chill. Take three cups of water and boil inside a pan. Once it reaches rolling hot add the vermicelli and allow to cook till soft. Drain the water and rinse it water and set aside in a bowl. Soak a teaspoon of sabja seeds in half a cup of water for 10 minutes. Drain the water and set aside. 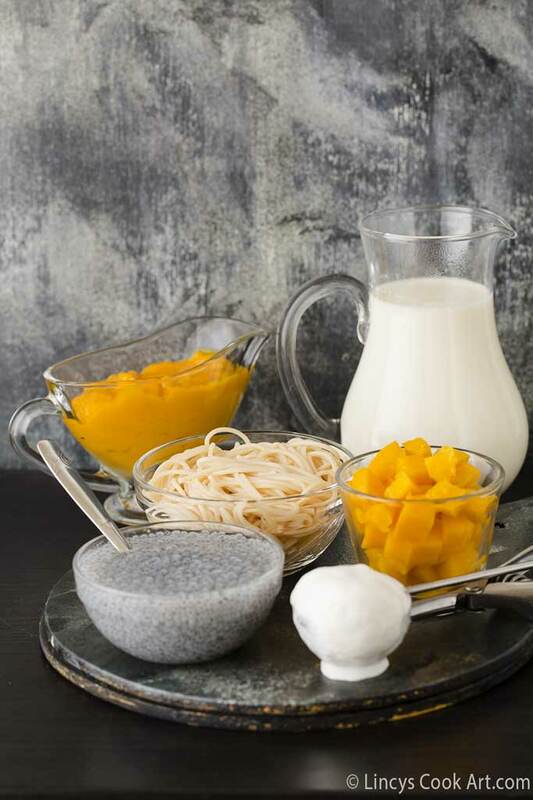 Take a cup of mango and add a tablespoon of sugar and puree it in a blender. 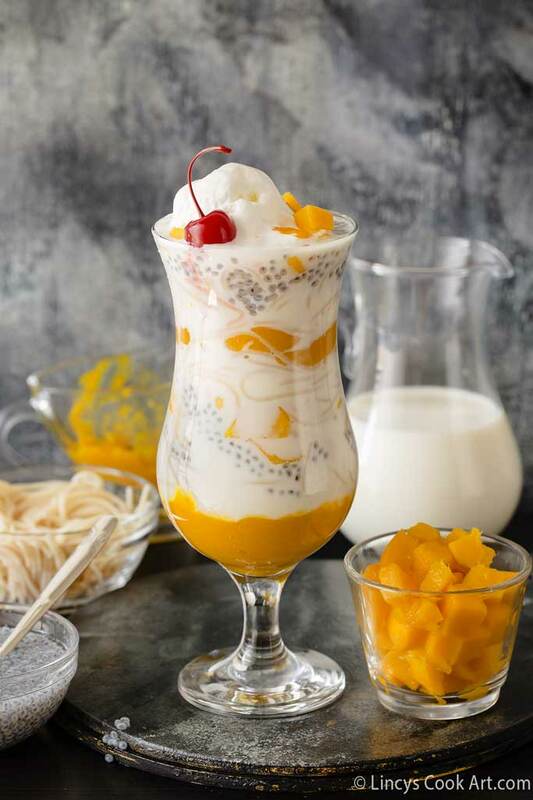 To assemble in a tall glass, add a layer of mango puree and then with cooked vermicelli then pour the chilled milk over it till it submerge. Then top it with soaked sabja seeds and chopped mango pieces. If it is a medium sized glass top it with ice cream and finish the layer. Or else repeat the layering once more. I have done twice for my big tall glass. You could use mango fresh or frozen chunks or pulps for this recipe. Check whether it is already sweetened or not, If it is sweetened skip the sugar. 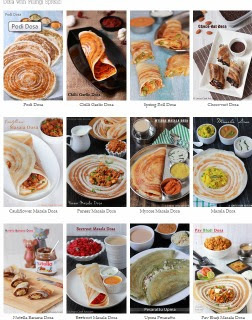 Adjust the measurements according to your taste. Adding some chopped nuts, cherries adds texture and visual appearance to the drink.